The two were arrested following a tip-off. 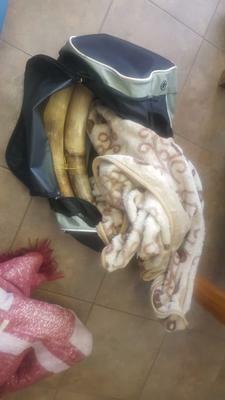 MAKHADO, March 16 (ANA) – Police in Makhado near Thohoyandou have arrested two women, aged 28 and 35, for possession of two elephant tusks, Limpopo police said on Saturday. The arrests emanated from a tip-off on Friday provided by members of the community about the suspects who were allegedly selling elephant tusks in an area outside the Makhado CBD, Colonel Moatshe Ngoepe said. A special Intelligence-driven joint operation comprising of the Makhado policing cluster task team, detectives, crime intelligence, and the stock theft unit was activated and conducted in the area, which led to the arrest of two female suspects found in possession of elephant tusks. The tusks were concealed in a black sports bag. The suspects would appear in the Louis Trichardt Magistrate’s Court soon. The police investigation was continuing, Ngoepe said.